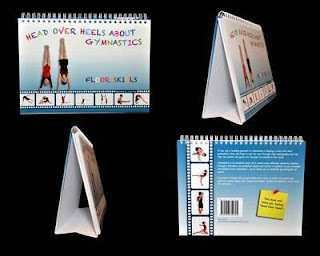 Head Over Heels About Gymnastics is a child friendly picture book written by Gemma Coles that introduces aspiring young gymnasts to the basics of gymnastics. Through photographs and easy to follow steps, the author guides you through the essential floor skills, and includes little helpful tips along the way! The book stands up and the pages can easily be folded over! The book starts out by teaching you some basic warm up activities, stretches, and key shapes that will be useful when learning new skills. The author also provides tips on how to have better posture when preforming/presenting to the judges. Throughout the course of the book you will learn basic rolls, leaps, walkovers, handstands, and cartwheels. I found the sticky notes on every page to be helpful reminders as to what you should be doing to achieve the best results! The step by step demonstrations preformed by both a male and female gymnast, also provide a clear, easy to follow instruction for young children. At the end of the book the author provides two easy to follow practice routines that includes everything covered in the book. Here’s a preview of one of the warm up pages! Overall I found this book very well written, and I would certainly recommend it to any parent interested with helping their young gymnast succeed.